Home Blog Why Are Fiberglass Garage Doors So Popular? Why Are Fiberglass Garage Doors So Popular? In our opinion, fiberglass garage doors present one of the best inventions of the last 100 years - read on for a number of reasons why homeowners across America love this material for their own overhead door. 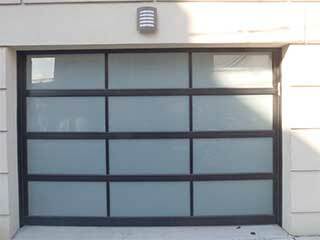 Fiberglass garage doors provide a wide variety of choice in design. They can be painted in various styles or more professionally designed and customized according to your preference. Fancy an eccentric garage door that makes your house stand out on the street? No problem! You can opt for stained-glass windows which are both elegant and beautiful - they'll make an excellent addition to your home. Due to the fact that fiberglass is naturally resistant to weather change, doors made from this material will not be damaged by high or low temperatures. It is also worth mentioning that fiberglass is also more resistant to scratches, warp, splitting and cracking than many other materials available. As far as your garage door maintenance is concerned, things are quite simple. Simply washdown your fiberglass door with a soft glass cloth and a mild detergent solution from time to time! We recommend a proper clean at least once a quarter, to tie in with the changing of the seasons. Fiberglass garage doors are extremely flexible in their use, meaning they can be used in doors that are designed to open either vertically or horizontally. Moreover, these modern products can be customized to your size selection - so there's no problem at all if your working to a non-standard size requirement. This type of garage door can easily support the weight of added insulation. So, if you live in an area that's likely to get really cold during winter, you can apply as much insulation as you need to your door and feel comfortable that your property is set up both to be warm & energy efficient. The added benefit of insulation is of course that it can also help to cut out any disturbing street noise. Interested in learning more about fiberglass doors and whether this might be the right choice for you? Our experts at Garage Door Repair Fernandina Beach would be happy to guide you in your decision - just get in touch today. Is Your Garage Door Safe to Use? Your garage door deserves attention from experts who care. For us, that’s all a part of our standard service – we don’t need to put a premium on making sure you get the repairs, maintenance and replacements you need. Browse our site to learn more about the services we offer! Thank you for choosing our company! Feel free to browse our website for more information in the meantime. Our team at Garage Door Repair Fernandina Beach is at your service any time!